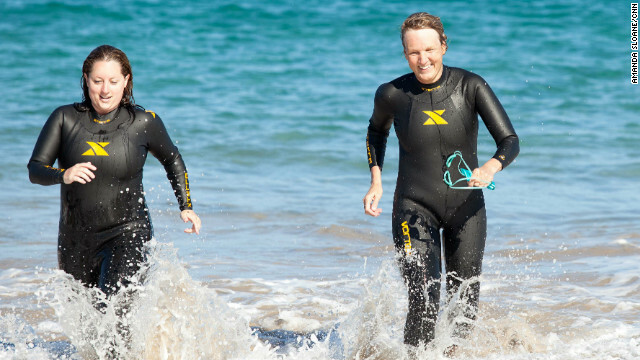 Nancy Klinger, right, runs out of the ocean after a training swim in Hawaii. Editor's Note: This time last year, Dr. Sanjay Gupta selected seven lucky viewers to be part of the Fit Nation Triathlon Challenge. Nancy Klinger, from Minnesota, was one of those viewers, and successfully competed the Nautica Malibu Triathlon in September. Want to be a part of the 2013 team? Apply here. Rick Morris in the middle of a long run during the 2012 Fit Nation midway trip. Editor's Note: This time last year, Dr. Sanjay Gupta selected seven lucky viewers to be part of the Fit Nation Triathlon Challenge. Rick Morris, from North Carolina, was one of those viewers, and successfully competed the Nautica Malibu Triathlon in September. Want to be a part of the 2013 team? Apply here. Hi y'all! It's me again. Who, you ask? Well... you know. It's me, Rick Morris. I'm the volunteer-firefighting, web-developing, home-brewing (beer), former smoker who just completed his first triathlon with the 2012 CNN Fit Nation Lucky Seven team. Come to think of it, I take that back. I now consider myself The New Rick Morris. And I owe it all to CNN. About a year ago I was sitting on my rump smoking a cigarette (from my second pack, and I just quit that morning) and drinking a jar of my finest when I came across Dr. Sanjay Gupta carrying on about this Fit Nation thing. He was asking for ordinary folk to submit a video application for a spot on the upcoming team. Think you can't tri? Think again! Editor's Note: This time last year, Dr. Sanjay Gupta, along with the CNN Fit Nation team of producers selected seven lucky viewers to be part of the Fit Nation Triathlon Challenge. Adrienne (LaGier) Forgette was one of those viewers, and successfully competed alongside Gupta at the Nautica Malibu Triathlon this past September. Editor's Note: Adrienne LaGier Forgette is one of seven CNN viewers selected to train for and compete alongside Dr. Sanjay Gupta in the Nautica Malibu Triathlon, which took place on September 16 in California. Adrienne and her husband Chris did the race together, just two weeks after their wedding. This is her race day journal. As I walk up to our pre-race meeting and delicious vegan feast at Rich Roll’s house in Malibu, the song "Home" by Philip Phillips pipes through the room. Trouble it might drag you down. After dinner, the pep talks began. Sarah Reinertsen reminds us of our power and strength. One of our producers, Caitlin, shares that 7 million people have read our blogs on CNN and have connected to our stories. Chrissie Wellington tells us that our potential is limitless. Jeff Dauler crosses the finish line at the 2012 Nautica Malibu Triathlon in California. I am a triathlete! Isn't that absurd? 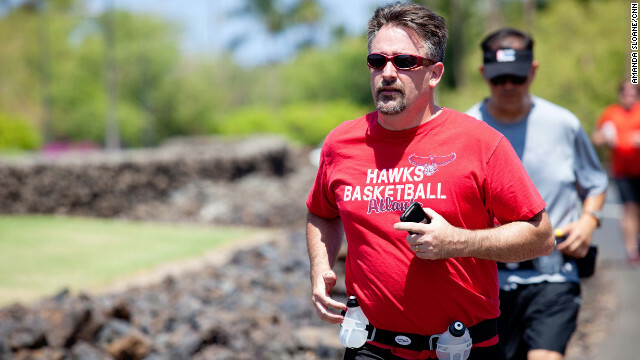 Editors' note: Jeff Dauler, a radio host from Atlanta, Georgia, is one of seven CNN viewers who was selected to be a part of the Fit Nation Triathlon program. 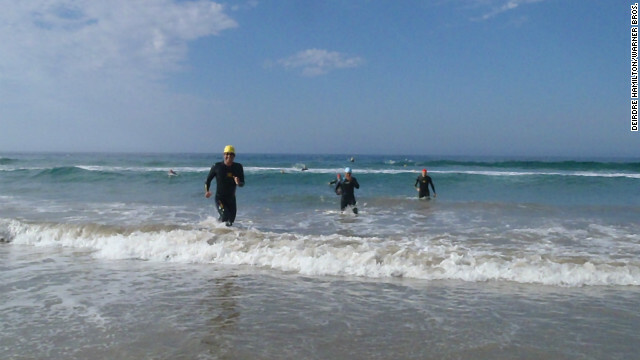 All of the "Lucky 7" crossed the finish line in the Nautica Malibu Triathlon on Sunday. A gun, some cheers, and then scores of red caps dash off into the Pacific. I watch the pro and elite triathletes swim toward the first turn buoy as I walk to the starting area with my team. In five minutes I'll be in that ocean. I am calm, peaceful, happy. Confident. Excited. I separate from my team and walk to the very back of the corral, and all the way to the left. I want to be the last one in the water, and I want to be far left so I could use the current as much as possible. The CNN Fit Nation Lucky 7 get major props for finishing the Nautica Malibu Triathlon this weekend, and so does NASA astronaut Sunita Williams. Williams did the swimming, biking and running events aboard the International Space Station using exercise equipment specialized for space. This makes her the first person ever to complete a triathlon in space. She said via NASA TV that her watch said it took her 1:48:43 for the three events and the transitions, although getting from one activity to another is a little different in space than for Earthlings. Williams used the onboard stationary bicycle for biking and the space station's treadmill for running. There's no pool on the station, however, so she used a simulated weight-lifting system. After finishing, Williams gave a shout out to CNN's Dr. Sanjay Gupta "who is really interested in health and fitness," she said. Williams is currently the International Space Station Commander for the Expedition 33 crew. Michael Martinez, in foreground, and teammates finish up an ocean swim in preparation for the Nautica Malibu Triathlon. Editors' note: Michael Martinez is a CNN Wire newsdesk editor based in Los Angeles who trained for his first triathlon with the Time Warner Fit Nation team. Martinez will race the Nautica Malibu Triathlon on Sunday with teams for CNN and Warner Bros.
Before the sun rises every Sunday, I load the bicycle on a car rack, pack goggles and running shoes, and join dozens of other weekend athletes preparing for their first triathlon. Inspired by CNN's Dr. Sanjay Gupta and his example of average folk improving their health by entering in a “tri,” I’m at last readying mind and body for an endurance race of swimming, cycling and running. This is no ordinary triathlon. It’s the Malibu Triathlon. And it’s Malibeautiful. Here, the mountains meet the sea. The long arc of Zuma Beach is the center stage, and it evokes all the beauty that makes Southern California a paradise. Editor's Note: In the Human Factor, we profile survivors who have overcome the odds. Confronting a life obstacle – injury, illness or other hardship – they tapped their inner strength and found resilience they didn't know they possessed. This week we take a closer look at Glenn Keller, who is one of seven CNN viewers selected from around the country to train for and compete alongside Dr. Sanjay Gupta in the Nautica Malibu Triathlon. Here are his thoughts on this journey. Well, there are only a few days left. There is a little nervousness and a lot of excitement that we have made it to this point. When friends and family notice the weight I've lost and comment about how much better I look, it can only be compared to how much better I feel. Adrienne LaGier and her husband, Chris, after their wedding -- two weeks before the Malibu triathlon. 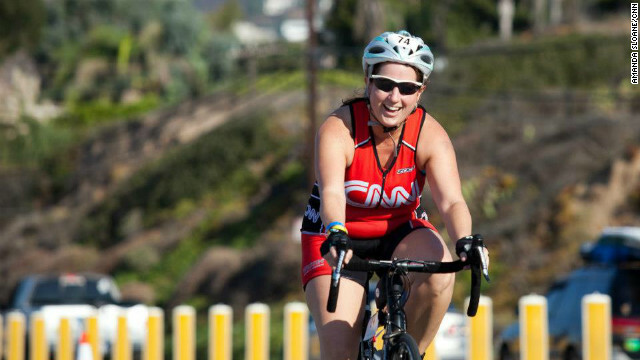 Editor's note: Adrienne LaGier is one of seven CNN viewers training for the Nautica Malibu Triathlon with CNN's Dr. Sanjay Gupta. In the week leading up to the triathlon, each of the "Lucky 7" is sharing his or her thoughts on the journey. In my application video, I told CNN that the biggest gift I could give to my husband Chris was to start our married life off in “fitness and in health." My teammate, Nancy, so kindly captured those words in a handcrafted wedding gift to us that will forever serve as a symbol of this promise. This journey has definitely given us that gift. We danced to every song the night of our wedding without leaving the dance floor once. We thank CNN for making that a reality -– along with making my teammate Glenn’s journey to be the officiant at our wedding possible after he got stranded due to Hurricane Isaac. 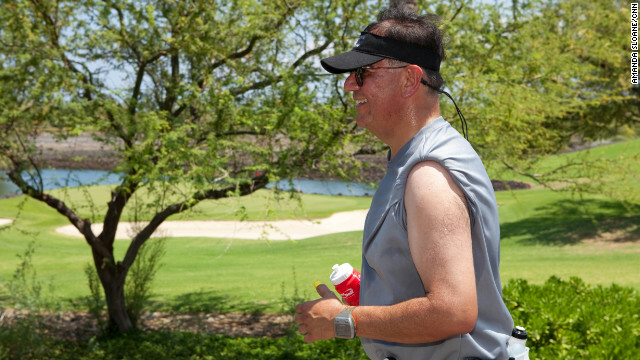 Carlos Solis goes for a long run during the Fit Nation training trip in May. Editor's note: Carlos Solis is one of seven CNN viewers training for the Nautica Malibu Triathlon with CNN's Dr. Sanjay Gupta. In the week leading up to the triathlon, each of the "Lucky 7" is sharing his or her thoughts on the journey. To be perfectly honest, when I applied to be one of the “Six Pack” last November, I wasn’t too sure what was involved in training for and completing a triathlon. What I was sure of was I desperately needed and wanted to make serious changes in managing my health or else I would be suffering permanent and painful consequences. Ten months later, I’m feeling healthier and stronger, and I know a heck of a lot more about my body and how it functions, particularly with diabetes.